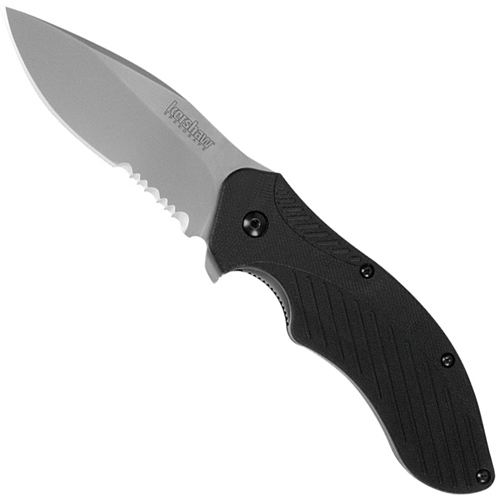 Kershaw Clash with Partial Serration Folding Knife has a solid feel with a 3 inch blade, making it perfect for any task. It helps you when working with boxes, ropes, heavy plastics or anything else. Both left and right handed people can easily open the Clash using a single hand. After opening, the locking liner ensures the blade would release only when you wish to unlock. Unlocking the blade is simple too-you just need to press the spring loaded lock. The SpeedSafe assisted opening ensures safety. The glass-filled nylon scales and wide and thick handle with a deep index figure indentation ensures a secure grip. The overall size of the knife when closed is 4 1/4 " and it weighs: 4.0 oz.